Quilts: Utility or Art? | Marlene Samuels, PH.D.
Like the quilts my mother sewed, my parents endeavored to stitch new lives from the scraps of their lives before the war — memories of the old country they toted with them. Those scraps survived entirely in their memories. 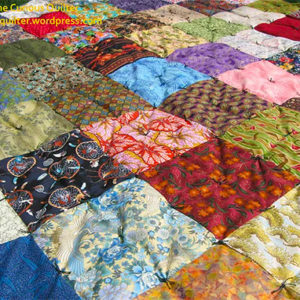 I saw no beauty in quilts because to me, their provenance was based upon scarcity and necessity. They were efforts at creating warmth and a sense of comfort from remains, sewn together to provide what otherwise was not to be found in a new and often hostile environment. My mother fashioned our quilts in lean times. My brother and I fantasized that one day we’d indulge in lush, intensely colored Hudson Bay blankets of thick wool with their trademark stripes both at the top and bottom.